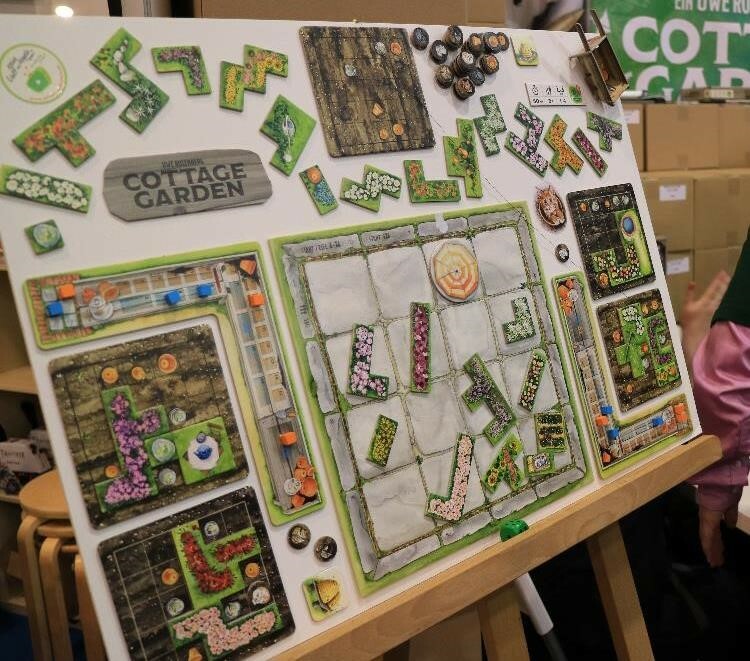 CBQ Padawn Yvonne Chi takes a look at Uwe Rosenberg’s Cottage Garden. 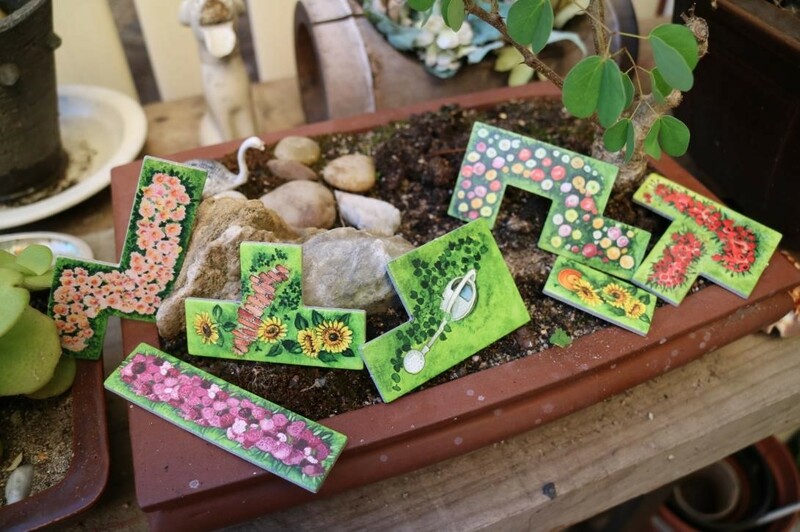 We really loved Patchwork, and who doesn’t love a beautiful garden? Imagine yourself sipping tea in a charming little garden next to the cottage. The ground filled with fresh soil that’s covered with colourful flowers. Crimson, violet, lavender, orchid, magenta, indigo, turquoise, emerald, lime, olive, orange, coral… a feast for the eyes. And green, of course, green…all shades of green. You take another sip of tea and indulge in the floral smell, while your cat bathes in the sun next to your feet. In walks the famous game designer Uwe. You stand up to greet him. He feels different to the last time you met him at the knitting event, perhaps it’s the colour of his shorts? Nonetheless you proceed to spend a lovely afternoon with him and a few friends in this charismatic garden. 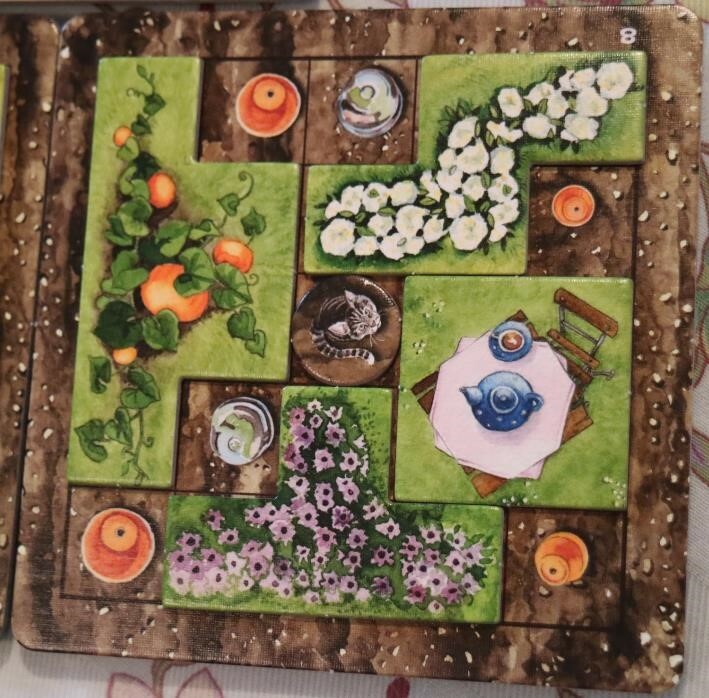 Cottage Garden is a 1 to 4-player tile placement game that plays out in about 60mins. This is another ‘tetris’ type puzzle game designed by Uwe Rosenberg in the style of his last 2-player game Patchwork. 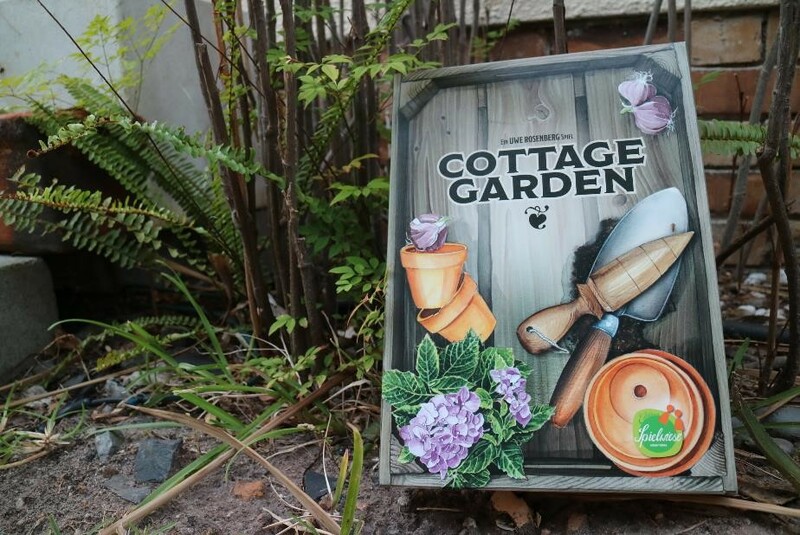 In Cottage Garden you compete in the art of gardening and gain points based on visible plant pots and planting bells whenever you complete a flowerbed. The game lasts 6 rounds and at the end of the game the player with the most points is the winner. I picked up my copy at the Essen Spieltage in October this year. I was fortunate enough to try out the game the night before the official public opening of Spieltage. As soon as I heard that it was designed by one of my favourite designers, I was game! When I saw the pieces set up, my first instinct was to associate it with Patchwork, which I also own and enjoy tremendously. I even helped showcase Patchwork at FanCon in Cape Town in May this year and found it incredibly easy to demonstrate and spark the interest of noobs and seasoned gamers alike. “This must be the 4-player version”, I thought to myself! Bearing this in mind, I was undeniably bias towards Cottage Garden from the start. I was so eager to try it that I totally ignored fellow gamers (Tiffany & Steve from TheOneTAR on Youtube) discussing the misprint and all that cutting and pasting next to me #BoardGameGoggles. A few rounds into the game and I realised that it is not like Patchwork at all, even though the tetris puzzles are indeed similar. Nevertheless I had my mind set on picking up a copy the next day, especially after Tiffany told me that it was going at E25. What a bargain! So the next day I wandered to the booth. The publisher Edition Spielwiese is a new kid on the block, but the booth was hard to miss as people gathered around the counter querying about the game and asking for a copy (some even asked for multiple copies). The game certainly created some buzz having been listed on Fairplay and Geekbuzz. The Spiel special was E25 and recommended retail price was E30, and I have a strong suspicion that the misprint helped to lower the price. But that’s just my take. The production is definitely top notch and worthy of the Rosenberg name (did I mention that he is one of my favourite game designers?). The pieces are very colourful just like a typical cottage garden. Personally I find the colours a little bit too busy but it doesn’t undermine the game in anyway. The cardboard is sturdy and prints are clear. The use of a green dice to represent the gardener and a round marker adds light-hearted element. 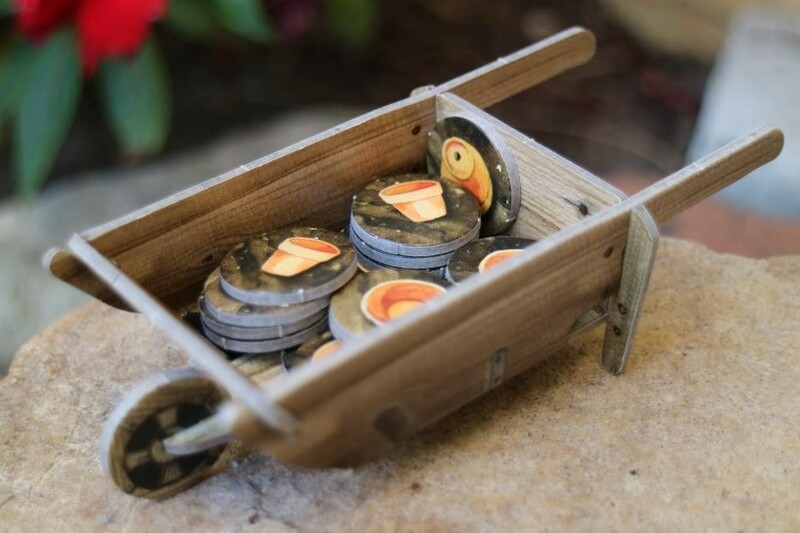 And just to satisfy my OCD, Mr Rosenberg included a large parasol token to allow players to pick and choose flower tiles from the nursery game board. Well done for that! I tried the game with all player counts and found it very smooth and easy to explain. There may be some confusion on how to handle the jump between 15 points and 20 points, but the rulebook makes it very clear. I would definitely classify this as a gateway game that can be played over a cuppa with casual gamers. For the more serious gamers however, this may be too light or possibly a filler game, depending on the player count (4 players is definitely longer than 1 player, as expected). The most strategic decision making and the main twist to the game is Round 6, where a penalty applies to all players who still have flowerbeds to complete. It is how the game balances scoring and can bring a nasty surprise to new players. Other than that this is not a game for analysis paralysis (although each to their own…). There is also an official solo variant in the rulebook which is also very well explained. The game runs very smoothly with very little critical decisions, a solo game can easily be finished in 20 minutes. Finally, for those who are as curious as I was, the puzzle pieces feel the same as those in Patchwork, but the two games certainly operate very differently. For one, the player count is different. Cottage Garden works well on all player counts from 1 to 4; while Patchwork can only accommodate 2 players (there might be an unofficial solo variant that I haven’t tried). The other main difference is the currencies in the games. 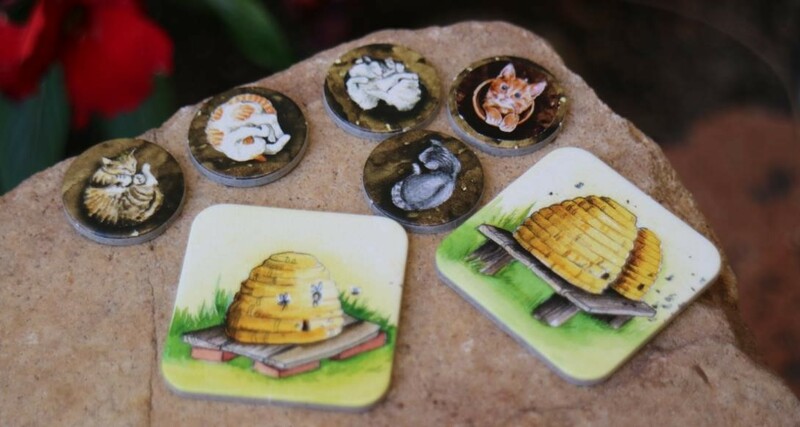 Cottage Garden doesn’t require any currency, you are racing scores against the other players but there is very little urgency to it. You choose which one of your two flowerbeds to focus on and you do it at your own pace. You sip some tea, try a flower tile, if you like it you keep, if you don’t like it you try another piece. The other players have scones and chat about the weather while they wait for you (sure they can look at the pieces they want to use, but you get the gist of it…). In Patchwork time is of the essence. Each piece requires time to sew and the buttons become the currency of the game. There is certainly more engagement and urgency as you compete head to head with another player, especially if this player is better at establishing an economy of buttons. With more buttons you can buy better pieces and with buttons you can win the game. This might be a little exaggerated as I demonstrate the differences between Cottage Garden and Patchwork. To put things into perspective, both being 2-player games, Patchwork is not as mean and cut-throat as 7 Wonders Duel in my opinion, and Patchwork is still fun and sociable. 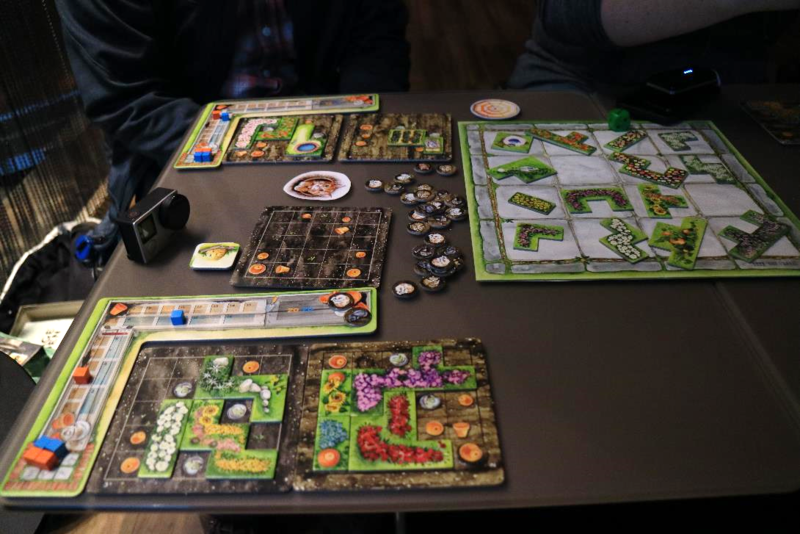 I would recommend Cottage Garden to couples who often have friends over for a casual game, to a family of four, to any “muggles” #nonGamers or to the serious gamers as a filler game. On the other hand, Patchwork is suitable for muggles too, be it a couple’s date night, two school-aged children or even for knock out tournament competitions. 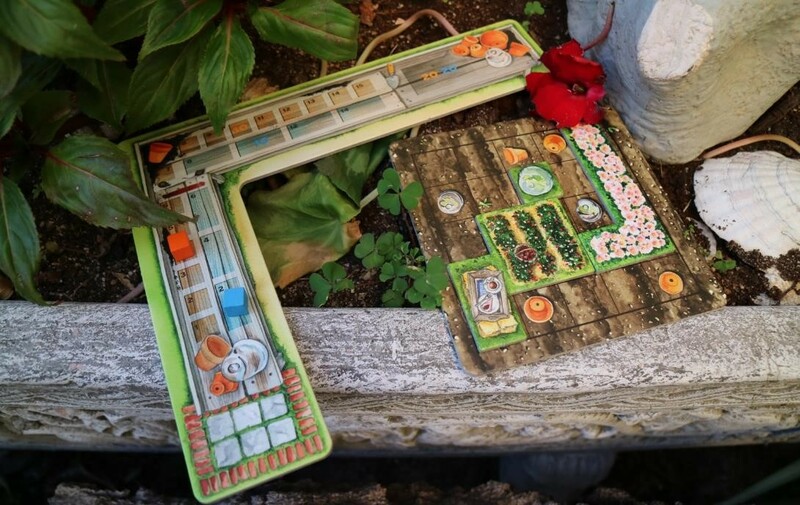 Again, this is just my opinion, both Cottage Garden and Patchwork are solid games. So there you have it, Mr Rosenberg did it again. And now it’s up to you to try it out and decide for yourself if this is the game for you. All photos credited to Yvonne Chi. All rights reserved.